The Pet Zone Smart Scoop Automatic Cat Litter Box is a good unit if you’re looking to cut down on the amount of scooping you do. The device automatically cleans the litter box – ensuring cleanliness at all time. Instead of scooping, you’ll have time to do the things you enjoy. The unit works with through special sensors that detect when your cat exits the litter box. Once a cat leaves, the device begins to count down from fifteen minutes. Then the cleaning cycle begins, and all the clumps are removed. If a cat re-enters or a different cat enters – the timer resets and the fifteen-minute countdown starts when the litter box is cat-free once again.Once the unit begins cleaning, a metal rake is deployed. The rake collects all the clumps while leaving the litter in the box. These clumps are swept into a waste drawer. The Pet Zone Smart Scoop Automatic Litter Box features a sturdy rake motor that is quiet when compared to other models. You can use any clumping cat litter with this unit. An ole’ disposable bags are fine for the waste compartment. You won’t be spending extra money on replacement supplies with this Pet Zone product. The Pet Zone Smart Scoop Automatic Litter Box has dimensions of 25.5″ L x 18.25″ W x 7.6″ H. The litter area is large at 16″ L X 14″ W. The unit weighs a little over 9 lbs. It’s important to understand that this unit will require scooping on occasion. This is especially true if you have a large breed cat with an active bladder. This fact can be negated a bit by using a high-quality clumping cat litter. As well, you will need a decent amount of space for this unit. 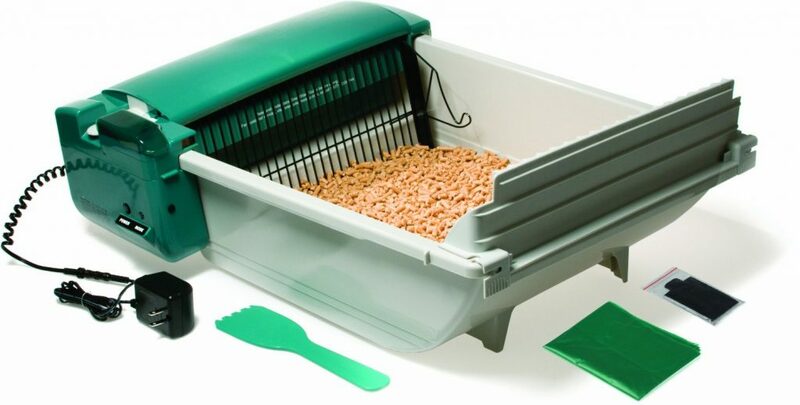 The Pet Zone Smart Scoop Automatic Litter Box is larger than the average automatic box. 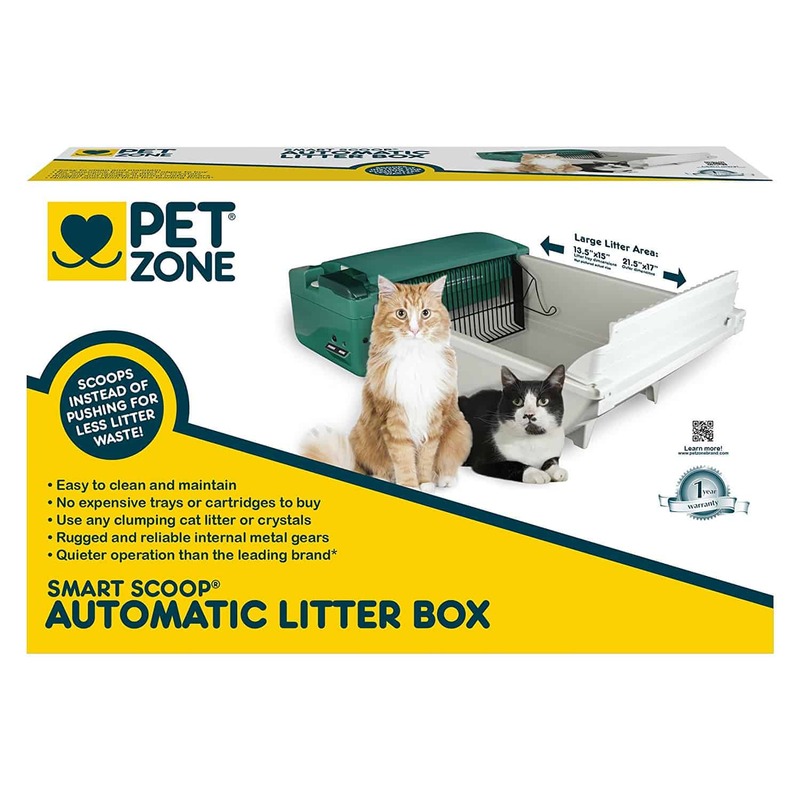 Pet Zone Smart Scoop Automatic Cat Litter Box is a solid choice, especially for cat owners looking to minimize their touching of waste or daily scoring. The unit works as advertised and keeps the litter box fresh at all times. High side walls ensure the litter stays inside the box. This unit is not maintenance-free. You will have to scoop on occasion and check to make sure everything is running properly from time to time. The unit works well for trips of two to four day. If you’re consistently gone for longer than four days at a time – this is not your unit. You may want to take a look at our self cleaning litter box reviews for another choice. The device is not good for kittens, either. Pet Zone shines with multi-cat household and large breed cats. The device will work for cats of any size, but the heavy duty construction and size lend itself to big cats. By using a high-quality clumping cat litter – you can avoid most of the issues this unit may face. Overall, the Pet Zone Smart Scoop Automatic Cat Litter Box is a great option for many cat owners looking to scoop and smell a little less.